Demi Lovato is the star in todays fun dentist game as you will be able to meet up with her and start fixing her teeth as she has been having some mild toothaches and she needs you to look and see what the problems are. 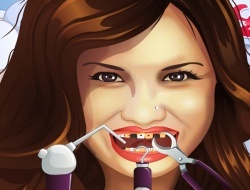 There are quite a few stained teeth and some may even have cavities so you need to make sure that everything will be straightened out in there or else she will not be confident enough to perform well on stage. Have fun and you will surely enjoy your time with this superstar that will surely recognize you at her concerts. Demi Lovato Tooth Problems 9.20 between 0 and 10 based on 5 votes.